The BlueParrott B450-XT Noise Canceling Mircophone Headset blocks out 96 percent of ambient sounds with advanced noise-canceling technology, and its HD voice feature makes speech easier to understand so you can focus on your conversation. This BlueParrott headset provides a 300-foot range for Class 1 Bluetooth reception. It offers large ear cushion, padded headband and deliver powerful sound and enables simple wireless pairing with your Bluetooth-enabled device. 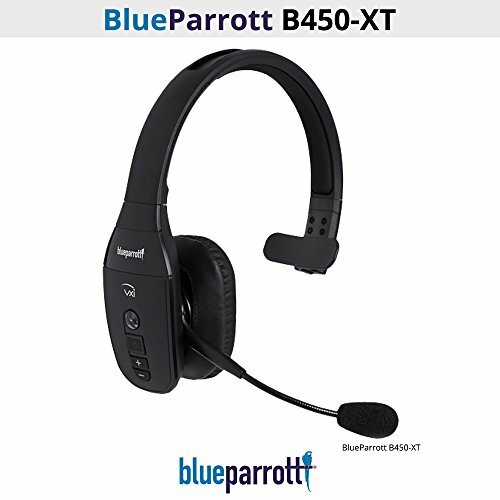 The B450-XT also has more advanced Parrott Button features, like voice control, for hands-free control of headset functions, and voice memo record. - Advanced noise-canceling microphone eliminates 96% of ambient noise. - Voice Control to answer or reject calls with just your voice. - HD Voice makes speech easier to hear and understand. - Class 1 Bluetooth delivers extended (up to 300-foot) range. - A2DP support for streaming audio from Bluetooth devices. - Large ear cushion and padded headband are comfortable and durable. - Be heard clearly with the industry's best noise-canceling microphone technology. - Tap to easily pair your phone or other Bluetooth device via NFC. - Stream music or GPS instructions. Voice Control to answer or reject calls with just your voice. If you have any questions about this product by VXi BlueParrott, contact us by completing and submitting the form below. If you are looking for a specif part number, please include it with your message.